Automatic changeover circuit jacky January - 20 - 2010 11 Comments Description. 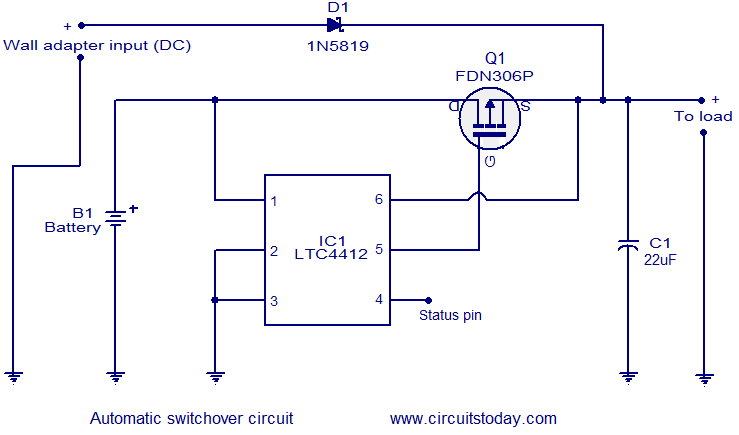 The circuit diagram shown here is of a automatic changeover switch using IC LTC4412 from Linear Technologies. This circuit can be used for the automatic switchover of a load between a battery and a wall adapter.LTC4412 controls an external P-channel MOSFET to create a near ideal diode function for power switch over and load sharing. This makes the LT4412 an ideal replacement for power supply ORing diodes. A wide range of MOSFETs can be driven using the IC and this gives much flexibility in terms of load current. The LT4412 also has a bunch of good features like reverse battery protection, manual control input, MOSFET gate protection clamp etc. The diode D1 prevents the reverse flow of current to the wall adapter when there is no mains supply. Capacitor C1 is the output filter capacitor. Pin 4 of the IC is called the status output. When wall adapter input is present the status output pin will be high and this can be used to enable another auxiliary P-channel MOSFET (not shown in the circuit diagram). The wall adapter input can be anything between 3 to 28V DC. The battery voltage can be anything between 2.5V to 28V. Do not connect loads that consume more than 2A. Maximum continuous drain current of Q1 (FDN306P) is 2.5A. D1 (1N5819 is a 1A Schottky diode. Q1 (FDN306P) is a P-channel MOSFET.